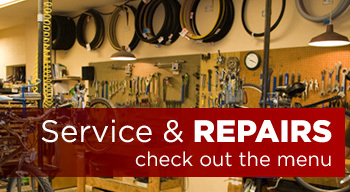 We’ve spent 35 years serving the bicycling community of the Flathead Valley and building lasting relationships with our valued local customers. 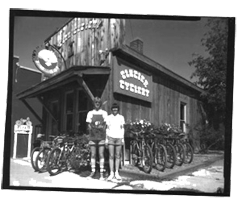 Glacier Cyclery opened its doors in downtown Whitefish, Montana when Whitefish was the quintessential small town America and the Flathead Valley an undiscovered summer paradise. Our customers were our neighbors, the local paper reported good news around town and we played Frisbee on Central Avenue waiting for the occasional customer to stop by. Glacier Cyclery sold so few bikes in those days and each sale was so appreciated, that we still remember who bought what bike and sometimes even its color. Then along came the mountain bike. While some debate who invented the mountain bike, around here we all know that it was a local Montana mountain man, thus the term “mountain bike.” Regardless of who invented it, everyone wanted one and Glacier Cyclery grew with the demand. Glacier Cyclery has long been the resource for bicycling in Northwestern Montana and these days a large portion of our customers are visitors to Glacier, Whitefish and the Flathead Valley. 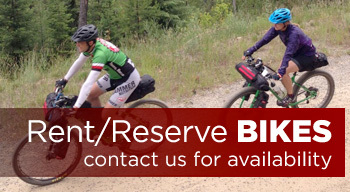 Numerous touring companies operate out of Whitefish and several Adventure Cycling Association touring routes come through town. 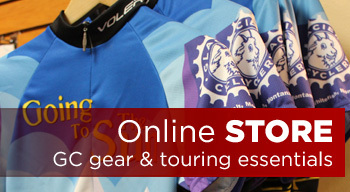 If you are planning a trip to our area you need to visit Glacier Cyclery. Whitefish is now a busy summer resort area but the core of our business is still the local cyclist. A lot of our first customers who bought Miyata Ridge Runners and Diamond Back Ascents in the 80’s are still Glacier Cyclery customers and riding buddies, and some of them are now buying Glacier Cyclery bikes for their own children (and grandchildren!). It’s a great thing that makes being “in business” worth it! Browse our site, enjoy yourself and we look forward to seeing you in the store some time soon. 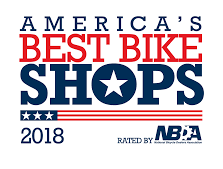 For the past 5 years, Glacier Cyclery has been recognized by the National Bicycle Dealers Association as one of America’s best bike shops, and we are proud to hang the Best Bike Shop certificate again in 2018. Out of the 4000+ bike shops in the US, only 170 had this prestigious honor bestowed upon them. Unlike other industry bike shop awards, this one was not based on money spent with bicycle companies or popularity. Our rating was based upon a strict set of criteria over six separate categories, plus feedback from a mystery caller, a mystery shopper and an in-store visit. We scored perfect marks in the categories of Marketing Excellence, Community Involvement, Local and National Advocacy and Knowledgeable Staff. We are quite proud of this acknowledgement and would like to take this opportunity to not only pledge to continue to keep up the good work, but to thank you, our customers, for making us continue to want to provide the best possible service we can. We won’t let you down!